4 Of My New Favorite Things! I might have mentioned I finally upgraded to a smart phone this December. So my on-the-go social media posts got an upgrade as well. Since my Facebook posts are largely scheduled (you didn’t really think I have time to post twice a day do you??? ), I’ve been putting the fun impromptu food stuff on Instagram. I’m personally finding Instagram to be sooo fun. I mostly follow foodies so I’ve been learning about all kinds of things. Like to look for Langostino tails @ Costco. And about Tinstar Ghee which is tested and certified dairy free. And about OMGhee, a small artisan ghee company. And people are raving about FlavorGod spices. And local meat companies like I’ve been learning about making plantain pancakes. It’s endless and has been fun! Maybe it’s just who I’ve chosen to follow but my Facebook world doesn’t really collide with my Instagram world. I’m seeing fresh faces and learning cool new things. Pictured, you can see a few of my new favorite things! Wild USA Langostino I got at Costco. Super duper for a quick dinner. Tonight we made zucchini noodles (zoodles) in ghee with Langostino and it was AMAZING. Johny said better than lobster as the meat was sweet and tender. (He’s still talking about it!) I have more of each so tomorrow is a repeat but I probably won’t go through the trouble of making more zoodles and will just slice and dice the zucchini. Think lobster scampi. Think lick the skillet! Costco also recently has added Organic Dark Tart Cherries. Think a bowl of fruit. Add some healthy pomegranate seeds. Think smoothies especially if you do raw Cacao. Nom! Cherry Chia Pudding. The options are endless. My FAVORITE new thing: Paleo Wraps. Since Johny packs a lunch every day, I really bought these for him. Thinking of how great it would be to have a roast beef rollup, egg salad burrito or even breakfast burrito’s on on a rushed morning. But guess who’s eating them? You guessed it. Me. Yours truly. I read all the reviews. Some said they were too coconutty but I don’t think so. Some said they were too thin. I haven’t had a single one crack or tear on me. And I’ve been eating them at every meal since they came in the mail. They are just 3 ingredients: coconut meat, water, and oil. 100% coconut so a great brain food too. They are dehydrated so they aren’t really perishable. In a zip lock, they are said to last 10 months. My pack of 49 won’t last that long! I’m already pondering ordering 49 of the turmeric Paleo Wraps. 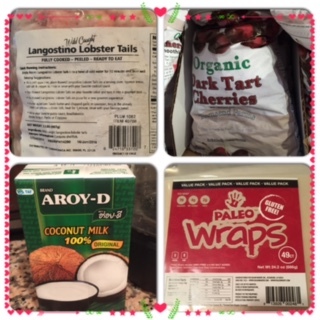 Health, Blessings, Paleo Wraps and more Langostine! Methylation – What you NEED to understand!